High performance computing (HPC) systems are being used to fill these needs, primarily with x86-based cluster computers and Lustre storage systems. The technology is well developed, but the scale of the problem demands medium to large-sized systems, requiring a significant capital outlay and operating expense. The most powerful systems deployed by oil and gas companies are represented by petaflop-scale computers with multiple petabytes of attached storage, which match some of the most capable supercomputers at national laboratory HPC sites. 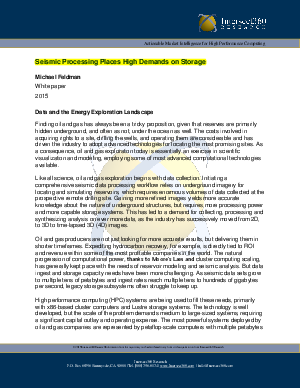 For oil and gas systems, however, there are some notable differences in terms of time to market urgency as well as application productivity, data availability and ease of management requirements.